Water tower inspection by drone and concrete structure diagnosis. Results obtained from 211 aerial images taken by the company Adeole. Circular inspection carried out as part of a study aimed to automate the step of surface damages detection. 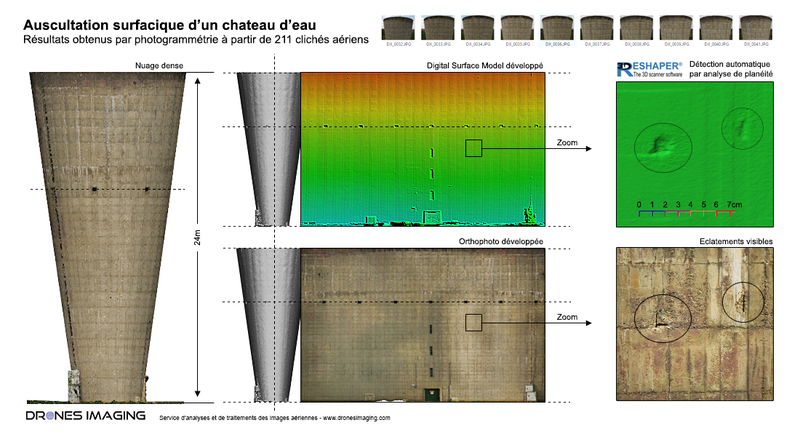 Realized with the 3DReshaper software, the flatness analysis of the Digital Surface Model (DSM generated by aerial photogrammetry) allowed the algorithmic detection of about ten holes on the external structure and their classification by gravity levels (depth holes), impacted area and height (by altimetric coordinate). Subsequently, the RGB orthophoto (superimposed on the DSM) also allowed the holes to be textured in order to precisely identify the nature of the damages. For example and as illustrated above: bursting of concrete with corroded apparent reinforcement constituting a major danger for the durability of the structure..
A brilliant use case of a semi-automated workflow where MNS and Orthophoto were complementary: the first used for the damages detection and the second for the pathologies interpretation. Dense cloud : 70 million points.